Lisa Smith of rural Mayetta and her family know that a dog is more than just “man’s best friend” — at times, a dog can also save a man’s life just by finding him. Proof of this lies in the fact that three of the Smith family’s dogs — Mister, a white German shepherd, Otis, a bloodhound, and Laudie, a border collie — are in various stages of training to save the lives of people who get lost, whether accidentally or of their own accord. 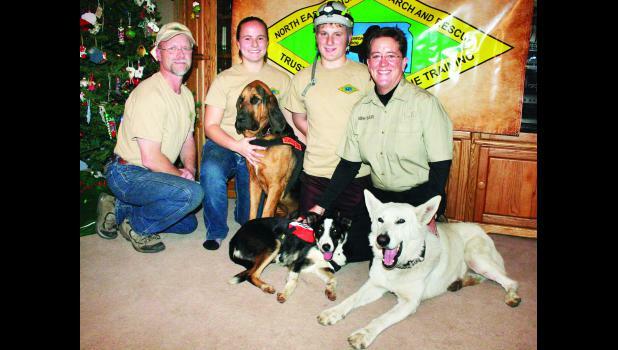 “It’s kind of a family affair,” says Lisa Smith, who recently returned from a Search and Rescue Dogs of the United States (SARDUS) certification clinic where Mister received a national Type II Wilderness Air Scent certification. Indeed, Lisa and her family — husband Kevin, daughter MaRyka and son Karsen — have been involved in search-and-rescue dog training for about five years. The Smiths are involved in a group known as Northeast Kansas Search and Rescue, or NEK-SAR, which trains dogs for hunts such as the certification training that Mister received in Colorado. NEK-SAR was founded in September 2012, but the Smiths got started when Otis came into their lives a few years back. Mister has been with the family about as long, they said, with MaRyka adding that he’s “the most active” in search-and-rescue training. Lisa also describes Mister as “a one-person dog,” which, in a way, is helpful during training. Each dog also has its own “reward system,” and with Mister, it’s treats. With Laudie, on the other hand, it’s a favorite toy. Dogs are also trained in different disciplines, whether they are “life find” searches or cadaver searches. Laudie, whom Lisa said is “just starting,” has the potential to become an expert hunter on both counts, while Mister excels in “life find” searches, and Otis has begun cadaver searches under MaRyka’s training. A dog’s greatest asset in search-and-rescue training, the family said, is its sense of smell, although training in hilly terrain puts that sense to the test. Lisa said the recent SARDUS certification work in the mountains of Colorado was difficult for her and Mister, since there were more hills and valleys to deal with, and MaRyka concurred that working in such terrain can be difficult for dogs. The greatest reward, for the handlers, comes from watching the dogs put their training into practice and find the people they’re looking for, whether alive or dead, Lisa said. In the latter case, she added, cadaver search dogs “help provide closure” for those involved in the search. On the human side, people involved in search-and-rescue are required to be 18 years of age before they can get certified with their dogs. Karsen, who is 15, serves as a “flanker,” a position they can attain at 15 if they are working with another family member who is certified for search-and-rescue, while MaRyka, a senior at Royal Valley High School, recently received her certification and sees it as something she will continue to do in the future. As for the dogs themselves, Lisa said that “about any breed of dog” can be trained for search and rescue, just as long as they have the “aptitude” to be trained. Laudie, who has only been with the family for about three months, “just had all the attributes I needed” for search dog training, she added.